Photograph of the Bheer Dam in Nasirabad. This print was taken c. 1871-72 by an unknown photographer is from the 'Photograph album of Major General Jackson Muspratt Muspratt-Williams.' It shows the construction of the Bheer Dam at Nasirabad, Rajasthan which was designed and built by Colonel J.M. Williams, 1871-3. 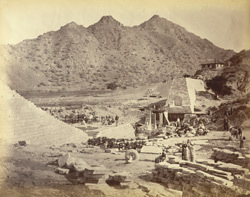 The photograph was taken at a later stage of construction, with the stone walls of the dam at an advanced stage (apart from middle section not yet built up).